Millburn Town Hall is located at 375 Millburn Avenue, Millburn, NJ 07041; phone: 973-564-7000. 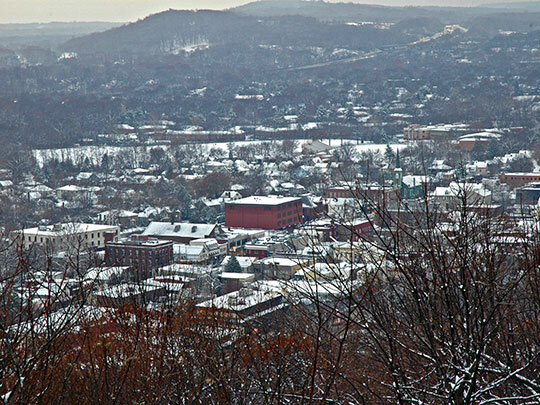 Photo: Downtown Millburn viewed from South Mountain Reservation. Photographed by User:Leifern (own work), 2005, [cc-by-3.0 (creativecommons.org/licenses/by/3.0)], via Wikimedia Commons, accessed November, 2013. Millburn, is a one-talkie town pierced by several lakes and surrounded by many hills. Rich commuters live in impressive dwellings bordered by tall cedars and well-kept lawns. Settled by Elizabeth farmers and Upper Montclair Hollanders some 50 years before the American Revolution, the town flourished along with its paper mills and hat factories. Both industries are gone, but a lone factory, employing about 25 girls in the manufacture of garments, now occupies the town's principal historical site, Vaux Hall, at 40 Main Street. Here, in the simple two-story brick building, lived the Reverend James Caldwell. At the Hall House on Parsonage Road, Mayor A. Oakey Hall of New York found refuge from Tammany Hall and Boss Tweed. Old-timers recall how two white ponies hitched to a carriage used to carry the mayor for his daily mail. The Paper Mill Playhouse — Brookside Drive between Main Street and Glen Avenue, at the entrance to South Mountain Reservation — is a center of Millburn's cultural life. It was established recently by the Newark Art Theater which, aided by wealthy patrons of the arts, transformed the 15O-year-old Diamond Paper Mill into an ultra-modern headquarters for drama, art, and afternoon teas. South Mountain Reservation, an all-year playground, spreads over the ridge immediately north of Millburn. More than 2,000 verdant acres, mostly in their natural state, stretch across hills and dales, woodland, and meadowland. Bridle paths wind through and around the park, and fishermen sink their bait in the East Branch of the Rahway River. In winter there is skiing, tobogganing, and sledding. In summer the curving trails attract hikers, and the grounds, with open fireplaces and fresh spring water, draw thousands of picnickers.